One of the true landmarks of science fiction cinema, The Day the Earth Stood Still (1951), "the Original Sci-Fi Masterpiece" according to the Blu-ray's cover text, comes to high-def as an ancillary, symbiotic release tied to its high-profile remake with Keanu Reeves. Probably more than a few na�ve consumers will pick this up assuming it is the Reeves film, and in any case the disc comes with an "e-Movie Cash code" for the remake. The disc's main menu is preceded by a very long (7:48) "sneak peek" of the new film; it's so crammed with spoilers that interested parties might actually decide they no longer have any reason to see it after viewing this extended trailer. Regardless of the success or failure of the remake, the original Day the Earth Stood Still for the most part looks fantastic in high-def - it's a major and very worthwhile upgrade. The disc is positively choking with extra features, including a number of Blu-ray exclusives, though at least one significant older extra is gone to make room for the new material. My biggest complaint is reserved for the 5.1 DTS-HD Master Audio remix. While composer Bernard Herrmann's seminal score sounds fantastic and the directional sound effects are nice, the audio for this track has been sweetened with new sound effects that were never part of the original release. Fortunately, the original 1.0 mono track is also included. A flying saucer lands in Washington, D.C., and out of it emerges Klaatu (Michael Rennie), a humanoid extra-terrestrial. He declares that he's come to earth in peace and with good will, but when he reaches into his silvery spacesuit for something, a nervous soldier shoots him in the shoulder, wounding him. In response out of the spaceship steps Gort (Lock Martin), a large, metallic anthropomorphic robot that zaps all the guns, tanks and other military hardware with a powerful laser beam shooting out of its "eye," melting everything into pools of molten metal. Klaatu is taken to Walter Reed Hospital, where the President's secretary, Mr. Harley (Frank Conroy), apologizes for the misunderstanding. Klaatu informs Harley that he wants to meet with all the world's leaders simultaneously, to deliver an urgent message from the stars concerning the future of the planet Earth. This being the height of the Cold War (among other things), Harley insists such a meeting is impossible, that the leaders of the world "wouldn't sit at the same table together." Frustrated, Klaatu escapes into the night, hoping to better understand the situation by living among ordinary human beings. Assuming the alias "Mr. Carpenter," Klaatu rents a room at a boarding house, where its residents (including Aunt Bee from The Andy Griffith Show, Francis Bavier), are following the story of the alien's flight with intense fear and suspicion. (Bavier's character is convinced it's all a Soviet plot.) Only Helen Benson (Patricia Neal), a war widow, and her son Bobby (Billy Gray) think perhaps the alien is benign and that his mission might be peaceful. Klaatu/Mr. Carpenter takes a liking to Bobby, and together they visit the home of scientific genius Professor Barnhardt (Sam Jaffe, a delight here), obviously Albert Einstein in all but name. Klaatu later reveals himself to Barnhardt, and together they come up with a plan to bring all the great minds of the world together so that Klaatu can at last deliver his message. 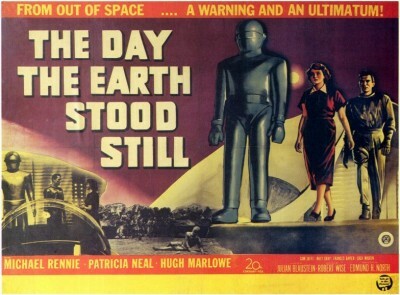 Unlike the majority of '50s sci-fi films, The Day the Earth Stood Still was a Class-A, Big Studio production. It cost about $960,000 to produce, slightly less than average for an "A" release in 1951, but an "A" nonetheless and clearly made for an adult audience. It's handsomely produced and at times very imaginative, though it does have several major flaws. Produced at the height of Cold War hysteria and McCarthyism, The Day the Earth Stood Still suggests maybe we ought to solve our planet's "petty squabbles" and halt the proliferation of nuclear weapons. Though that seems entirely reasonable, even obvious today, back then in some circles the very suggestion was tantamount to high treason. Reviews for The Day the Earth Stood Still generally were positive, but the film was not popular with the "My Country - Right or Wrong" crowd. The film remains timely - indeed more so in the wake of 9/11 - in the way Klaatu and Gort's appearance evokes fear and paranoia among the populace, and how it's exploited and exacerbated by sensational media coverage. (This may be the first Hollywood movie to extensively incorporate real newsmen into a wholly fictional story.) In one interesting scene, a CNN-type on-scene reporter plays up the fear factor, but when Klaatu-as-Mr. Carpenter is coincidentally interviewed and speaks intelligently, the reporter rudely cuts him off. Surprisingly, Klaatu's superficially sensible pacifist message plays much less so in recent years. His technologically superior society claims the same rights as the United States under the Bush Doctrine, the right to preemptively strike a perceived threat to its security. Certainly in 1951 - and for that matter, in 2008 - the threat to intelligent life elsewhere in the universe by mankind is non-existent: we simply don't yet have the technology to even reach other star systems, let alone spread like a virus our violent nature. And yet here's Klaatu ordering us to shape up - or he'll ship us out, reducing our earth "to a burnt-out cinder." Forget "regime change" - his solution is a police state of all-powerful robots like Gort, Blackwater-like Robocops with "absolute power over us." I've not seen the Keanu Reeves film, but it seems like exploring the idea of Earth finding itself in the same position as countries like Iraq and Afghanistan now have with the United States would be a valid and potentially interesting approach to the material. As an impressionable nine-year-old seeing the film on television for the first of probably close to two dozen times, The Day the Earth Stood Still played quite differently. It was the first movie I saw that had important things to say about contemporary issues. That what once played as earnest pacifism now seems rather more sinister doesn't detract from its overall effectiveness. The film is excellent on many levels. Fox originally wanted Claude Rains to play Klaatu, but Michael Rennie, then unknown in America, was a far superior choice. Lanky, articulate and almost ageless, projecting unusual intelligence and thoughtfulness, Rennie was and is immediately acceptable as a visitor from another planet. His flat accent, somewhat more Mid-Atlantic than British, avoids tying him to a specific geographical place. Indeed, he was virtually the template for such characters, and continued playing intelligent aliens on-and-off for the rest of his life. To cite one such example of Rennie's influence: isn't David Bowie's Man Who Fell to Earth cut from the very same cloth? The special effects are simple but just about flawless, and Bernard Herrmann's score, one of the very best ever written for a science fiction film, was monumentally influential. The film falls short in a few areas. Though Billy Gray is okay as "little" Bobby, clearly the part was written for (and would have played much better with) a much younger boy, perhaps a child of about eight. Gray was pushing thirteen and his dialogue - which would have been fine coming out of the mouth of an eight-year-old - plays phony in Gray's hands. Especially trite is Helen's first-class jerk of a fianc�, Tom Stevens (Hugh Marlowe). A painfully clich�d character designed to keep the plot moving along and to add suspense, the character begs the question: Why would Helen ever even consider dating such a man? In every scene in the picture he reveals new characteristics, all of them negative: he's impatient, greedy, irresponsible with children, jealous, suspicious, nosy, condescending, sexist, selfish ("I don't care about the rest of the world! "), a thief, and a snitch! Some boyfriend! Though studios seem reluctant to release pre-1953 classic titles to high-def, especially black and white, 1.37:1 movies, Blu-ray discs like the 50GB dual-layered The Day the Earth Stood Still, The Third Man, and Casablanca should go a long way to change that. And don't let online frame grabs sway you in either direction because they just can't do these films justice; you have to see them for yourself on a big monitor to fully appreciate what a revelation such films can be in high-def - even if you've seen them a dozen times before, including 35mm theatrical screenings. In the case of The Day the Earth Stood Still the awesomeness of the high-def 1080p transfer is intermittent, but extremely impressive when it appears. While dissolves, optical effects, and stock footage shots tend to be a bit soft, straight cuts are amazingly sharp at times. Here, on Blu-ray, you can actually read the names of the states engraved on the Lincoln Memorial, study the texture of Klaatu's spacesuit, or the details of the backlot streets and Washington locations. (Of course, the extreme clarity also means that now you can really, really see the wires holding Patricia Neal in place as Gort carries her toward Klaatu's spaceship!) Watching this makes me salivate at the thought of Fox eventually getting around to some of its best-looking noir titles. I was especially fascinated by the clarity of various matte shots, of London, Moscow, and Paris on the Day the Earth Stood Still, and by one especially complex-looking matte shot revealed here as a series of doughnut-like optical rings: in the center, the flying saucer, followed by one matte element of the army surrounding it, and outside that a ring containing the spectators, and out further still a ring of Washington landmarks in the distance. As stated at the top of this review, the 5.1 DTS-HD Master Audio adds new sound effects to the original film's soundtrack. Probably whoever did this thought they were enhancing the viewing experience and didn't realize they were altering the original film in the process. I noticed something was wrong as Klaatu first steps outside the flying saucer. In the remix, one can hear the idling of tanks and other military vehicles not heard in the original mono mix, which focuses instead on Herrmann's score and the murmur of the crowd. It's a shame this was done because the underscoring sounded great and the directional sound effects were kind of neat, but the added effects are an unwanted, unnecessary addition. I switched the mono track after discovering it. The disc is closed-captioned, and includes subtitles in English, Spanish, Cantonese, and Mandarin, along with 5.1 Dolby Digital Tracks in Spanish and French. The disc is "A" region-encoded. The Day the Earth Stood Still was first released to DVD in March 2003, with a supplement-filled laserdisc released seven or eight years before that. Director and screenwriter Nicholas Meyer's audio commentary track with director Robert Wise, along with trailers, still gallery, newsreels, and other extras have been ported over from those earlier releases. Most notably, a great 70-minute documentary featuring Wise, producer Julian Blaustein and others has largely been replaced, with elements incorporated into a new high-def show, The Making of 'The Day the Earth Stood Still'. Fans concerned that a lot of great material would be chucked just to be able to produce something new, however inferior, in high-def needn't have worried. It's a great show that incorporates audio from the interviews with those that have passed away, combined with new interviews with Patricia Neal, Billy Gray, and others (mostly film historians and scientists), buttressed with very good archival production photos, set drawings, original score samples, and whatnot. If anything it expands on the original featurette in interesting ways. Also new to Blu-ray are other high-def supplements. The Mysterious, Melodious Theremin and Main Title Live Performance by Peter Pringle are just great; fascinating and fun little supplements featuring one of the original instruments used in the scoring. Decoding 'Klaatu Barada Nikto': Science Fiction as Metaphor, A Brief History of Flying Saucers, The Astounding Harry Bates, and Edmund North: The Man Who Made the Earth Stand Still all enhance the viewing experience, though you'll need several days to go through it all. Race to Oblivion is a documentary short written and produced by North; Jamieson K. Price reads from Farewell to the Master, while a new, second Audio Commentary Track features John Morgan, Steven Smith, William Stromberg, and Nick Redman focuses in depth on Bernard Herrmann's music and other details. All of this material is terrific. Much less impressive - though clearly it's meant to really "Wow!" Blu-ray player owners - are two interactive features. Gort Command! is a firing-range-style video game, with the player assuming the role of Gort, firing his laser beam at human targets in the distance. The problem with something like this is that by contemporary video game standards this is a Big Nothing of a game, incredibly rudimentary; something the average 10-year-old will be bored with in about 65 seconds. The same holds true for Interactive Theremin: Create Your Own Score. The problem with this special feature is that it's set up nothing like the way a real Theremin works; it's more like an electronic keyboard/computer game, with no opportunity to actually create music that really approximates the unique sound of the instrument one never touches while playing it. Though I must confess all of The Day the Earth Stood Still's surprises long ago evaporated for me after so many viewings, on Blu-ray the greatly enhanced image was, if not like seeing the film for the first time, at least like seeing it with a never-before-experienced clarity. The extras are mostly very good and certainly plentiful, and though certain aspects about the presentation (i.e., the audio) is problematic, Fox clearly overall has done this title right. A DVD Talk Collector Series title. Film historian Stuart Galbraith IV's latest book, The Toho Studios Story, is on sale now.